The second session went well. It was, for me, a big batch of a big beer. 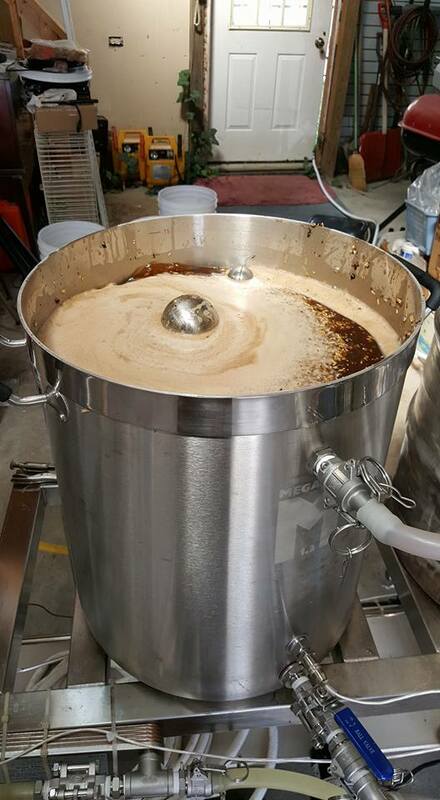 I scaled up the recipe for the 10%abv Russian imperial stout that I have produced several times on the Z to ten gallons for this rig. No room left in the mash tun, but it all worked OK. Batch size is a complicated decision. I can spend all day in the barn and make either 5 or 10 gallons. It seems a no-brainer to choose to make 10. On the other hand, it is a hobby and I can brew twice as frequently (and have more variety) by selecting 5 gallon batches. Right now my perceptions are skewed a bit because I have been making 2.5 gallon batches all year so even 5 gallons looks like a lot of beer. There is no economy of scale with larger batches because (to my surprise) propane consumption doubled for the 10 gallon brew and ingredient costs are constant because I always buy bulk grains. Meanwhile, the fermentation freezer is full. I don’t even have room for the 2.5g batch I brewed Friday so it is still sitting in a sink of cold water. I need to rack a couple of kegs from the freezer this afternoon. I’ll need to rack some more to make room for the brew I plan to do next weekend. Then I will be shut down until some more brews complete fermentation. Three weekends in a row on a conventional system is very unusual for me. I am just exercising the setup to make sure there are no surprises on the public brew day at the end of the month. Once a month will be normal, with small, low-effort brews on the Z to fill in the gaps.